Well it has been one of those days today, the sun is shining, the sky blue but its cold outside. So of course we are all looking for something to warm us through. 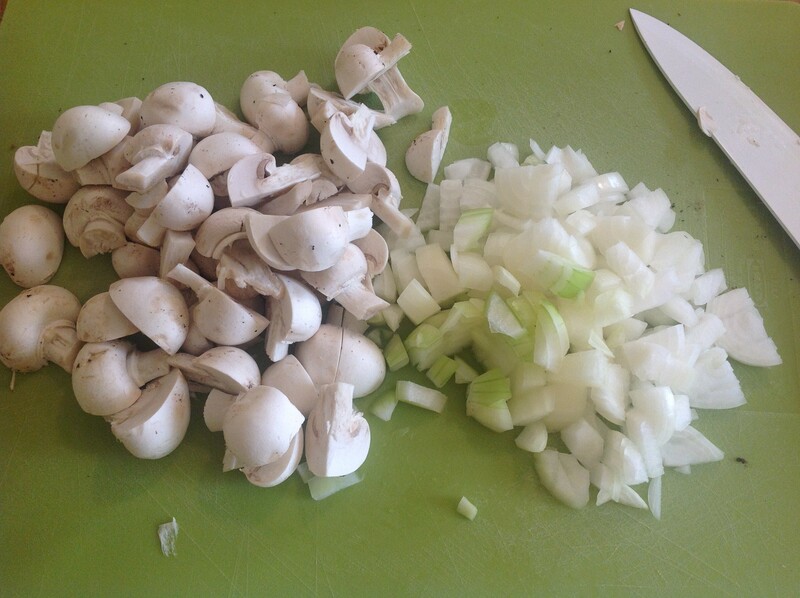 So a delicious risotto is on the cards for this evening. I decided that I would use up some frozen vegetables that were in the freezer too, need to make some more space for the up and coming cooking courses. 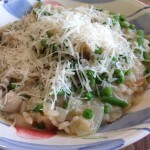 A risotto is fantastic dish that can be used for a weekday supper or an elegant dinner party. A few years ago we were on holiday in Corfu and we found a wonderful family restaurant that served Mussel Risotto, it was absolutely divine, I have recreated the recipe and will post it another day. 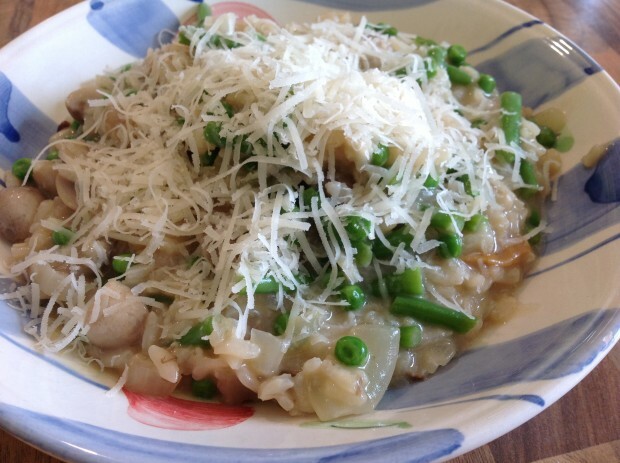 but it did give me a new view of what a risotto should be…. Start off by chopping the onion, relatively small, then prepare the mushrooms, depending on the size of your mushrooms, cut into quarters or halves, you want to keep them chunky. Add the butter to a pot and allow to melt before adding the chopped onions. Heat the stock in a pot and add the chopped mushrooms. Allowing the mushroom flavour to enhance the stock. 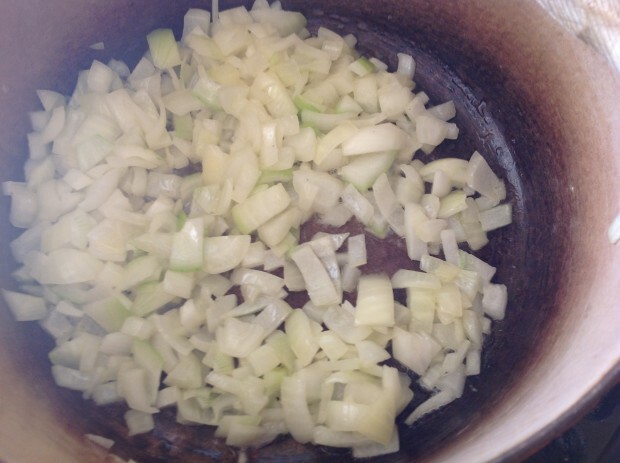 Allow the onions to cook in the melted butter until softened and add the crushed garlic clove. 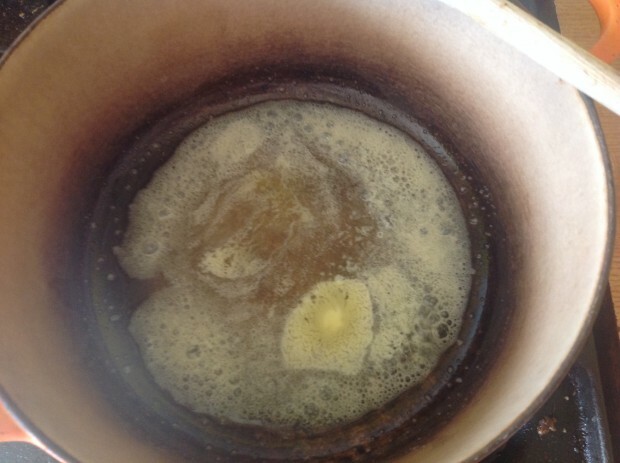 Then add the rice and mix well, ensuring that the rice is coated in the melted butter. Add the wine and allow the rice to cook in the wine, (3-4 minutes), mix to ensure the rice starts to cook in the wine. 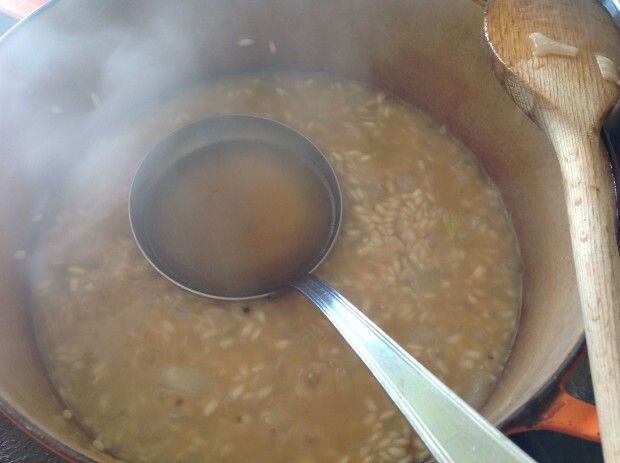 When the wine is fully absorbed into the rice, start adding the stock a ladle at a time, waiting until the previous ladle is absorbed before adding the next ladle. 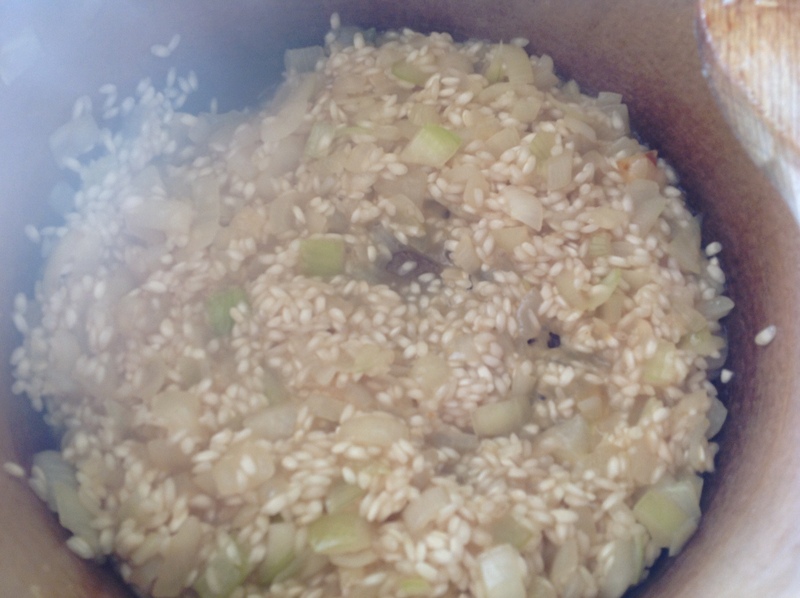 Continue until all the stock is absorbed and the rice is cooked. Test by tasting. 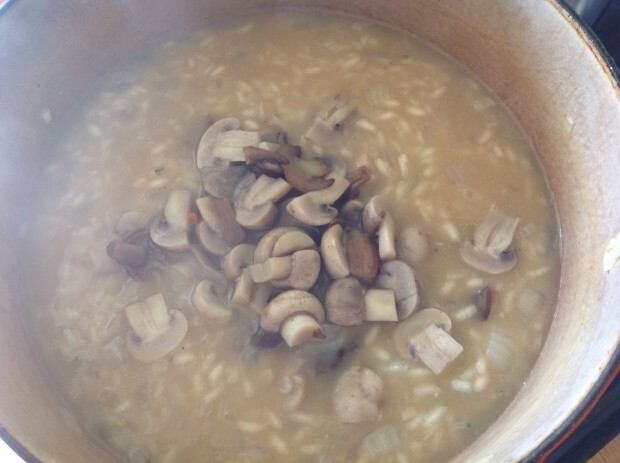 When the rice is ready, (softened with a little bite) add the mushrooms from the stock pot and mix through. An optional step is to add extra vegetables, I added some frozen garden peas and chopped green beans, for an added bit of colour and texture. 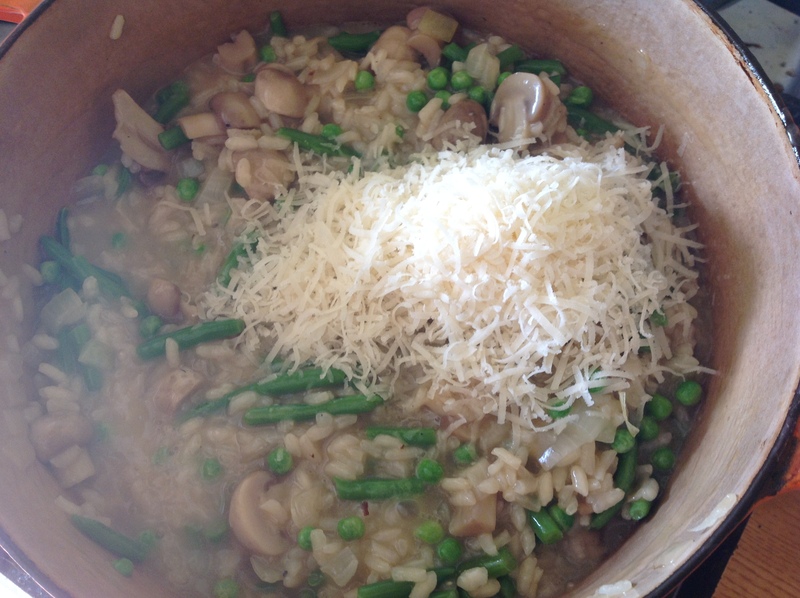 Add the grated Parmesan cheese and mix through, beating the risotto with a wooden spoon to create a creamy sauce. Add 2 teaspoons of soft butter and allow it to melt into the risotto. Mix again to fully combine. Now you will have a delicious ‘creamy’ risotto. Enjoy. 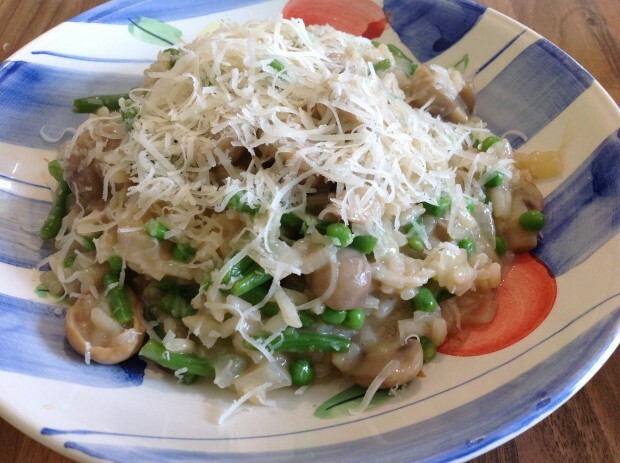 Delicious creamy mushroom risotto, ideal for any mid week meal. 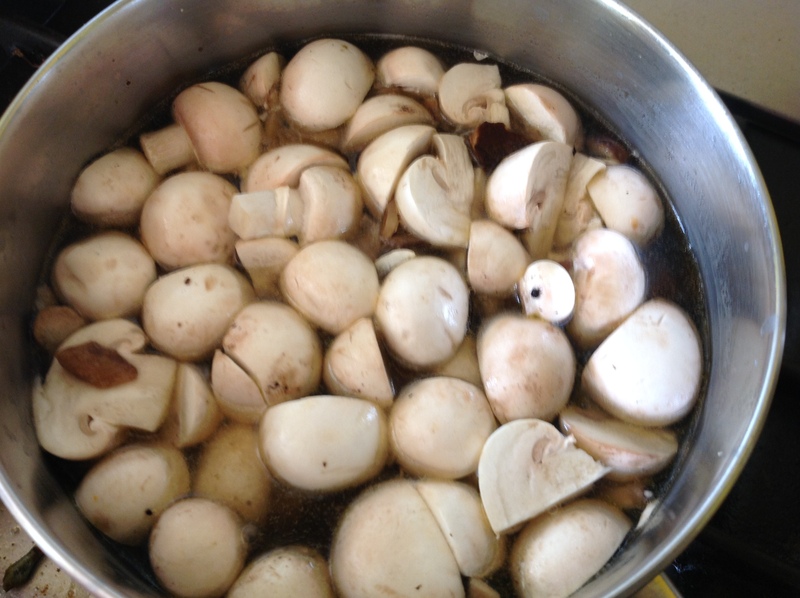 Make the stock in a pot and add the chopped mushrooms, bring to the boil and allow the mushroom flavour to infuse into the stock. Add the garlic and cook for another 1 minute. Do not allow the garlic to burn or it will turn bitter. Add the rice to the pot with the onions and garlic and mix to ensure the rice is coated in the melted butter. Add the wine to the pot and allow the rice to absorb the wine. Stir occasionally to ensure the rice is cooking evenly. Once the wine is absorbed, start adding the stock. 1 ladle at a time, allowing the rice to absorb the stock before adding the next ladle. Once nearly all the stock has been added, check the rice to see if it is 'done' yet. It should be soft, but with a little bite to it. 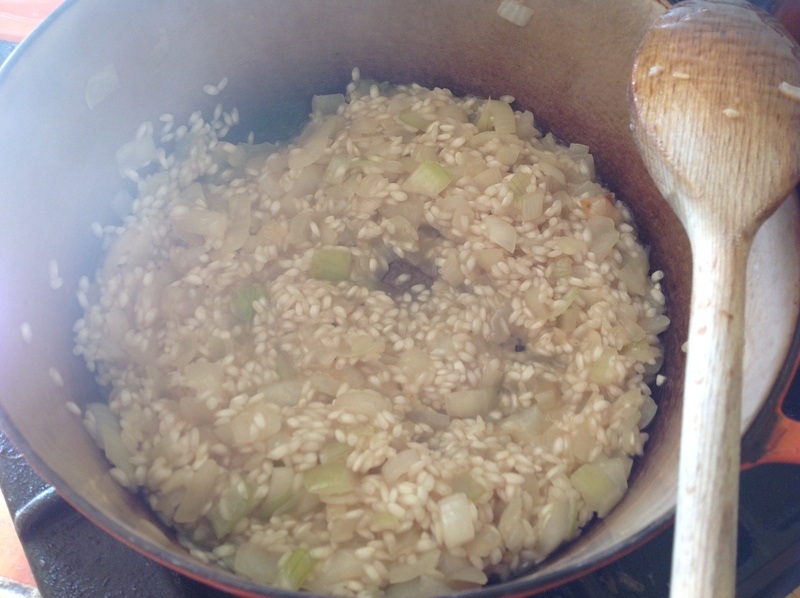 Beat the risotto with the wooden spoon, this will bring out the starch and create a 'creamy' texture to your risotto. If you are using additional vegetables (I used frozen peas and chopped green beans) add them now and fold through the risotto. Add the Parmesan cheese and again fold through the risotto add 2 teaspoons of soft butter, allow to melt and fold through the risotto again. You will have a wonderful creamy sauce. When ready to serve, place a couple of big spoons of the risotto into a bowl and sprinkle the top with a little Parmesan cheese to taste. ** You can make this 30 minutes before serving. Cook until the stage of adding the mushrooms, (before adding the additional vegetables) turn off the heat and put a lid on, to keep the risotto warm. When you are ready to serve, remove the lid from the pot, and set a low heat under the pot, add a little boiling water to the pot and mix through the risotto, to loosen the mixture. Continue to mix the risotto is it is coming back to temperature and then add the frozen vegetables, Parmesan and butter and serve as above.